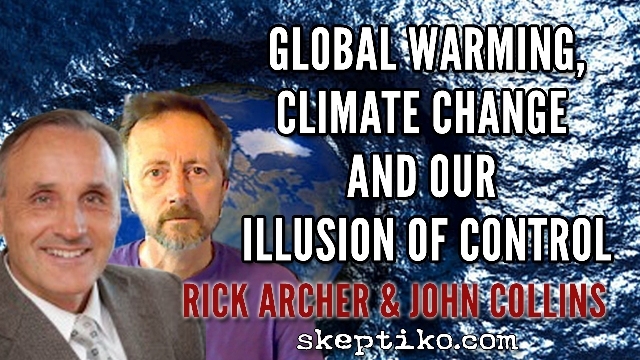 Interview with the Rick Archer host of Buddha at the Gas Pump, and John Collins from Maharishi University reveals controversy over the spiritual implications of global warming. I really enjoyed this interview, and did stick around to the end. I wish that you had dealt with Global Warming/Climate Change a little more though, because I didn't hear either of your guests budging on their apparent indifference to contra-indicators of climate change theory. The points you agreed on made sense to me, but your question remained important: why are you guys supporting policy decisions when the underlying support for those decisions is flawed? Speaking for myself, I do not have any problem with many of things being done to preserve our common environment, but I do disagree with some of those things and believe that climate change is a very bad argument to use to support anti-pollution and alternative energy efforts. I don't buy climate change as a theory, but it doesn't stop me from having a smaller carbon footprint than almost anyone living outside of a tribal society. As a vegan who doesn't own a car and who does recycle, there isn't much more I could do beyond giving up my computer. My reasons for these choices have nothing to do with climate change however, and I'm glad of that because if they were, I'd have to seriously reconsider them based on recent revelations in the climate science industry. I'm vegan because I don't like to eat anything else. It is as simple as that. If I was vegan for political or moral reasons, I'd probably be constantly engaged in a battle of willpower that pits my stomach against my sense of moral responsibility. As it is, I can ignore all the arguments: for health, kindness to animals, and reduced environmental impact, because my reasons are different. All the data could be wrong in those areas and it wouldn't matter to me because I can't stand the idea of eating anything but vegan food. As for not having a car, it's cheaper, unnecessary, and I love to ride a bike. Add to that the fact that bike paths in Holland are plentiful, well-maintained, and very safe compared to their counterparts in the US, and I have a great set of reasons to ride a bike instead of drive a car. Carbon credits, global warming/Climate Change, environmental consciousness are all irrelevant (to me) beside those other factors. Recycling is a bit different. I recycle because my wife makes me and the city I live in has set up garbage bins in such a way that it is almost impossible not to recycle unless you want to be a litterbug. I don't want to be a litterbug, so I take the extra trouble to sort my trash into the different bins provided. The point of mentioning all this is that if the end goal is that the carbon imprint of each member of a community is reduced, maybe it would be a good idea to use arguments that make sense to the people you are trying to convince. Climate Change strikes me as alarmist, fear-mongering, poorly supported, and riddled with fraud. Even if I believed in it wholeheartedly I wouldn't want to use it as a means to get someone to change their lifestyle if I had other, less easily faulted arguments at hand. This is even more true if those arguments are more meaningful to the person in question. A long time ago, before I realized I was and always have been a conservative, I participated in a protest against the use of carriage horses in New York because it was cruel to the animals. While there, I saw protesters throw red paint on a woman's fur coat. At that moment I lost all sympathy for the protest group. I agree that fur coats, particularly when factory-farmed animals are grown for the purpose of skinning them, is an abominable and cruel practice, but ruining some woman's fur coat to get the point across is a terrible way to make the argument. I feel the same way about anti-vivisectionists who break up medical testing laboratories. As far as I am concerned, the torture and murder that takes place in those facilities is cruel and pointless. It should stop and I would love to see it stop. However, destroying a lab and "freeing" the already severely injured animals only multiplies the damage (more money to suppliers, more animals bought as replacements for the lost animals, and a hardened position on the part of scientists involved.) The results of educating each other may not be immediately apparent, making it difficult to see if progress is being made, but as long as people think that vivisection leads to cancer cures, there will be people who want to perform vivisection. And that is the problem: that people want to do it. That desire is the issue, and that is where the problem must be solved. The problems that Climate Change theory attempts to solve are many, but addressing the issue as a scare tactic isn't much different from throwing paint on a red coat. What does wrecking a fur coat have to do with protecting animals? Not much, when the ruined coat is likely insured and will be quickly replaced thanks to the skinning of several dozen more animals. With Climate Change theory, we see many unintended consequences, some of which are economically costly with no real ecological return, and at the same time opinion hardens against the theory. What does that do? Does it make people more likely or less likely to worry about their carbon imprint? Why not create positive reasons to reduce their carbon imprint, like the beautiful bike paths that exist in the Netherlands, and not worry about complicated and flawed arguments like Climate Change? How do we balance our need for control with our need to take action? Pity you didn't manage to get Judith Curry on, Alex. She's the sanest voice on the global warming issue, and an actual expert, as opposed to the two people you had on. My guess is that she will have pulled out because of the "spiritual" nature of Skeptiko. There's not a lot one can say about the science part of the discussion based on the poor understanding and evident bias of your interviewees. One thing I will say is that when I see they are like this in relation to this issue, I lose a lot of trust in them as spiritual commentators. Seriously, if they are so biased and gullible about science, what hope for their opinions on spirituality? It makes me very pessimistic. Alex, I admire your tenacity in following the data wherever it leads and exposing the flaws in peoples arguments and beliefs. In the Psi/science/spirituality arena I think you do a wonderful job, and I'm sure you are making a big difference through education. I believe that education is the most important thing for positive change, in all areas. However, in this case I don't agree with your take on things. Traditionally in Skeptiko you have just followed the data, only to find that it often isn't really about the data, it's about peoples beliefs and corruption. Here, you seem to have started with the beliefs and corruption, and worked your way back to the data. I'm certainly no expert on climate change and I'm definitely no activist, so I probably won't take part in this thread, but I find your arguments way over simplistic, especially on the climate science. Also, as John Collins pointed out a few times you seem to be throwing the baby out with the bath water. If you look into any human en-devour in a global scale you will find corruption, but this does not negate the possibility of it being grounded in a truth. I don't doubt many of the corruptions and some of the conspiracies that you pointed out are true. I don't doubt that we are way over confident of our understanding of the earth. I don't doubt that there are entrenched beliefs. However, there are enough things that have been predicted, that are happening, to be cause for concern, and the stakes are too high for us to assume that nothing is happening. If we're wrong, if all we end up with is a cleaner earth through our misguided efforts then I'm fine with that. The things we need to do to combat climate change are the things we should really be doing anyway, for many reasons. Oil will run out, almost certainly in our lifetimes, that will be the real game changer. It will definitely happen, no one disputes that. We need to be prepared. Your argument about the 'poor people' having to pay for this 'big mistake' are more arguments against our choice of actions, not against no action. Also, if one believes the scientists, the poorest countries in the world are the ones who are already feeling the worst effects of climate change. I think you are right to call our for a measured look at this, and the scaremongering is not helping anything, fear is not constructive. But on the other hand, I believe that to dismiss as much as you do is also not balanced. It think it's vital to have some comprehension of the scale of issues. The climate system is enormous, highly complex, and poorly understood: the science is still in its infancy. Rick Archer talks ominously about CO2 levels being at 400ppm, when in the past they've been up to twenty times that. The proportion of CO2 put out annually as a result of anthropogenic activity is only around 4% of the total. This is dwarfed by output from the oceans (which have been warming since the last ice age), not to mention from insects and microbes. Even if we could control anthropogenic generation and reduce it to zero, the vast majority of it would still keep coming. If the earth were that fragile and sensitive to CO2, then we'd have had periods of catastrophic warming in the past: but we haven't. All the indications are that feedbacks are negative: if they weren't, the earth would have been a highly unstable system and life might well never have developed. And of course, the main greenhouse gas by far is water vapour: all the scenarios of doom only work if it's presumed that feedbacks are positive; but increase in certain types of clouds would increase albedo, constituting a negative feedback. I think it's the fact that environmental issues have become a cause celebre of the New Age movement that carries a lot of the blame. So-called spiritualism and environmentalism have become conflated, and Rick Archer in particular seems to have swallowed a lot of it hook, line and sinker. Not all, to be fair: he's aware of the problems with biofuels, for instance. It all started with Rachel Carson's Silent Spring, which led to worldwide restrictions on DDT, which caused the death of millions of poor people due to malaria. If we're not careful, the global warming boondoggle is also going to kill millions: through the rising cost of food because of biofuel production, thousands may already have starved to death. Then there's excess deaths in higher latitudes due to increased costs of energy for heating: this is due to subsidies being put in the pockets of the rich, and the plebs may end up paying for it with their lives. However, there are enough things that have been predicted, that are happening, to be cause for concern, and the stakes are too high for us to assume that nothing is happening. Please name three. Be careful: do your research first. I have not done any research on climate change and I have very little exposure to mass media, so my knowledge on this area (on both sides) is very limited. I expect people here will have ready made counters to anything I say, and I have not studied in the counters to those counters so I know I'm going to lose this game, so respectfully, I won't take you up on the offer. I may watch this thread for a while, because I am always interested in learning and changing my views. But so far, I haven't found the few arguments that I've heard against climate change particularly compelling. I'm always ready to go against the mainstream, I'm about as non-mainstream as one can get in many ways, but in this case I just can't see it. I'm perfectly open to having my mind changed, but at this present time it doesn't interest me enough for me to go away and spend time researching it. I suspect that I'll also get quite a few dislikes if I carry on posting, and climate change is not the reason I visit Skeptiko, so it would probably reflect unfairly on me. Fair enough, Stewart. By the way, you need never fear getting "dislikes" from me: as a matter of personal policy, I never give them; at worst, I might signal a disagree now and then. I wish everyone would eschew dislikes: it's too tempting to use them as weapons! Oh wow - I was hoping we were not going to bring up global warming (sometimes called climate change) again in the new forum, but since we have, it is perhaps worth reading about the wonderful story of the scientists who went to study the melting of antarctic ice - and got stuck in the ice! Sorry it is Fox News, I am actually not a right wing person, but this scam is bringing many poorer people to despair - they can't afford their heating bills and but food as well. It is a horrible perversion of the environmental movement, as I think more and more people are starting to realise. I may watch this thread for a while, because I am always interested in learning and changing my views. But so far, I haven't found the few arguments that I've heard against climate change particularly compelling..
Like Michael. I don't use the like/dislike system. If you are really interested in the counter arguments to the climate change theory (it used to be called global warming, but they changed the name after about a decade of flat global temperatures - which tells you a lot about the movement), I'd suggest "The Hockey Stick Delusion" book. The essence of the whole story is a perversion of statistics and the peer review process. Like Michael. I don't use the like/dislike system. I do use likes, but not dislikes. Passions are running high in this podcast and thread amongst those decrying the concept of climate change. In fact, passions are running so high I have to ask myself, who cares so much about the study of climate that they would become so outraged? This usually only happens when ideology is at stake, such as a visceral distrust in government (I'm not dissing that, just sayin'). Judging from the level of anger, the climate change bashing seems to me like it must be a stalking horse for a larger ideological agenda or platform or framework or whatever. I'll show you my ideology if you'll show me yours . I come at things mostly from a technical background. As it happens I spent much of my career studying time sequence data including a lot of computer modeling (not climate data I hasten to add). Looking at the charts below from NASA, which seem rather typical, it's clear we won't know what recent (last 14 years) temperature measurements really mean for another decade or two or three. There is certainly no clear indication here that global warming is a failed premise, or whatever the phrase in the interview was. Whether they're right or wrong (and they're no doubt wrong in some ways - it's long term trends that are important) the climate models being used are mostly for extrapolating long-term consequences, 50 or 100 or 200 years out, not for modeling short term fluctuations which would require more like weather models. When I go to articles in the mainstream media denouncing the idea of climate change based on recent data I find they typically are rather selective of the data they are showing. The charts below, on the other hand, show general temperature data for three broad latitudinal bands of the planet for the last 113 years or so (up to 2011 or 2012 it looks). You can see the trends and you can see the fluctuations for yourself. If you spend a little time reflecting on the trends and the fluctuations, divorced from preconceptions, I think you will find it hard to argue that the idea of climate change has been discredited. At least, that conclusion eludes me. I could give many more examples. Just go to WUWT and search for "giss adjustments". The usual trick is to adjust the past by cooling it, making the slope to the present steeper. I agree. I really wanted to do this show because this kinda feel good fuzzy thinking really peeves me. If you're an atheist then your life has no meaning -- by definition! If you're worried about worldwide CO2 levels bend down and kiss your backside goodbye... it's only gonna get worse. funny, but the "baby out with the bath water" thing was one bits that really pushed more over the edge. What's your BABY? What's your BATHWATER? I disagreed so as to not blemish your score I encourage you to dive in. You obviously felt compelled to post... I encourage you to push further. Look at Judith Curry, she's not perfect, but more honest than most. Thank you for taking a stand on this, Alex. I remember being at a Buddhist convention where they talked about how the climate is changing. I found their position deeply contradictory, since Buddhism teaches that everything is impermanent. And so climate is impermanent, and the rate at which climate changes is impermanent. Trying to control it, to keep it in a steady state is EXACTLY what Buddhism says we should not do about anything. We should not be attached to one particular kind of climate and try to cling to it. That will cause suffering, because climate is impermanent. IMO, the white-elephant not being discussed at any length and was momentarily mentioned, is the fundamental strategy and goal of policy issues or forced change, is control. Control methods are through food, education, communication, and energy, but energy is not just one of the powerful control methods, it's the method that controls the others. Alex barely mentioned Cold Fusion, before it was brushed aside with the Thorium Reactor endorsement. Yeah, Thorium Reactors were a good idea 50 years ago, but they still use radioactive material and are dangerous. Cold Fusion represents a paradigm shift in energy, which is, laughably, an idea that is already 25 years old. The peer-review alone is undeniable, but lab results speak for themselves. When studying Cold Fusion it soon becomes clear that there are several theories and devices that demonstrate novel methods to extract energy from the universe wholly apart and magnitudes more efficient and safe than burning any hydrocarbon or nuclear fission that make wind and solar more of an annoyance. Solar likely has a future, but I don't see wind there. How could this be? It appears from my reading, research of others, scientist from various disciplines, and historical evidence, that science promoted and taught today is a hollowed out shell. And only that science that is non-threatening, does not conflict with certain limitations and guidelines is permitted. The Biefeld-Brown Effect is an example. Supposedly debunked by Myth-Busters and denounced as a simple "ion wind" with no practical use becomes irritatingly ludicrous when the full breadth of the research is studied. This is made clear from following it's discovery, then disappearing from public review, leaks of it's use, and the many scientist who have stepped forward refuting misinformation. Electrogravitics just isn't propulsion, there is an energy extraction. But of all the taboos, that is a ruthlessly and viciously attacked technology, is anti-gravity and since electrogravitics sort of falls under this category it is ABSOLUTELY sanctioned and scrubbed from science. But then there is the Holy Grail of energy, Zero-Point. The extraction directly from the fabric of space-time. Of course, that and all I have mentioned have been thoroughly marginalized, ridiculed, and have had the giggle-factor attached to them, because main stream academia dictates this and therefore main stream media repeats and reenforces that continually ad nauseum, then it's all followed by federal and state sponsored education continuing to ignore and dumb-down any knowledge. I believe it's very likely there are many technologies that would solve many of the global crisis unfolding, but then that might diminish profit margins, challenge the status quo, and loosen the bonds of control or slavery, because if you think about it, that is what it is and is happening.